I finally finished an artwork that I made for a coworker’s nursery. 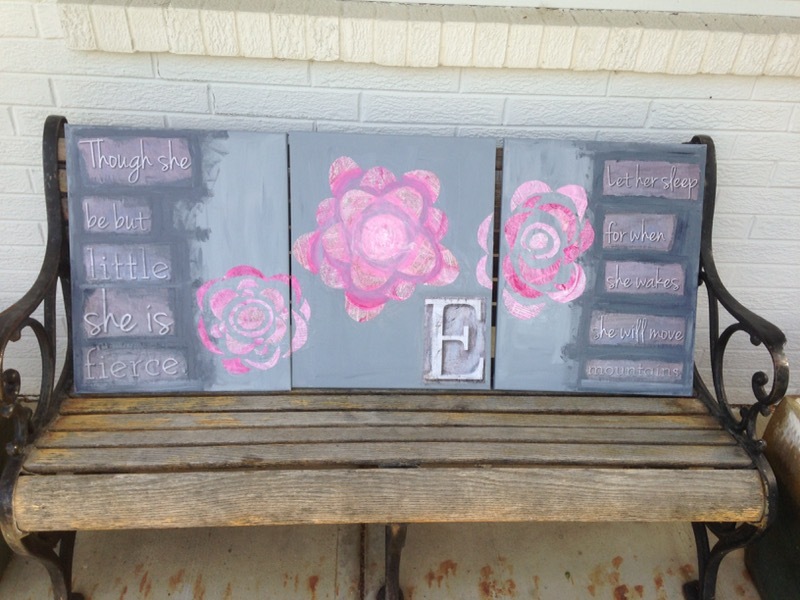 She sent me some color requests – pinks and grays, 2 quotes she liked and a general idea for the artworks. I got to work, slowly, much more slowly than normal. But, hey, it was a busy spring for me. 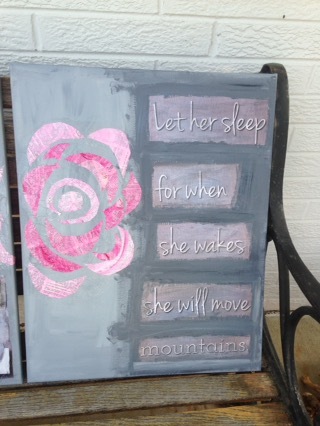 The quotes are printed and then collaged onto the canvas. 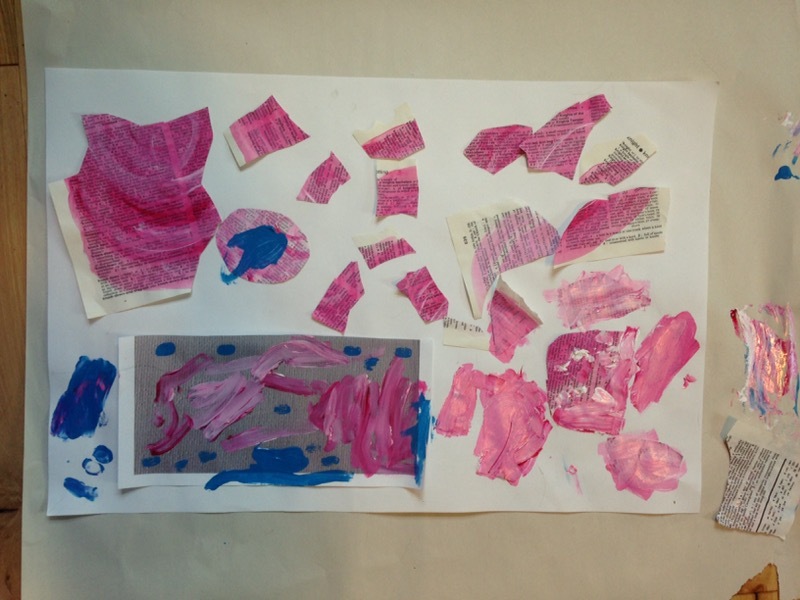 I sealed the collaged areas in my favorite collage material – gloss gel medium. The flowers are also collage, done from painted pages from an old dictionary. 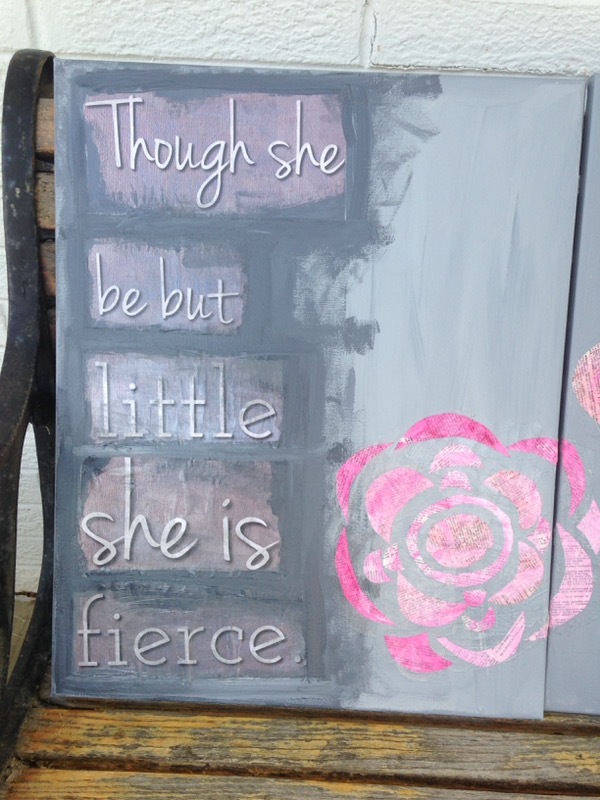 I used a palette knife to rough up and wrinkle the collaged words, for a more aged effect. 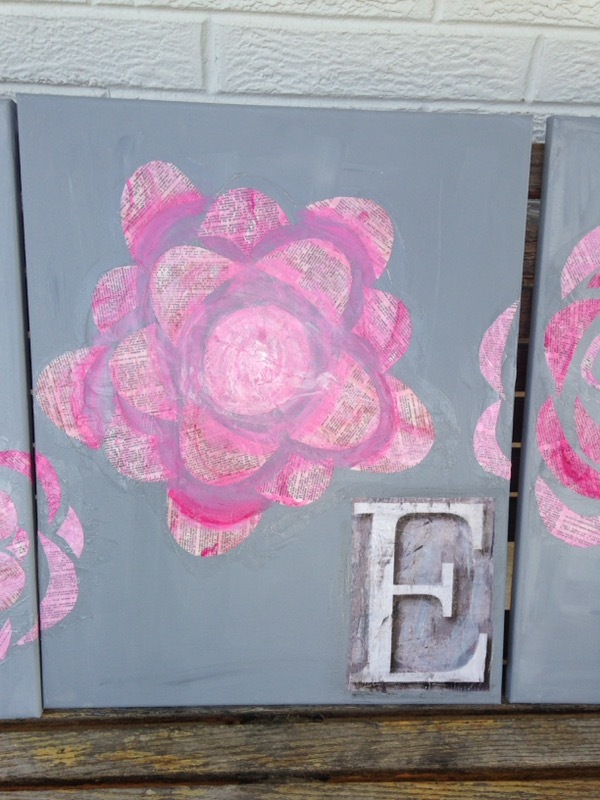 The flowers were inspired by some of favorite and currently blooming flowers – peonies. This huge, pink beauty of a bloom was picked from my backyard earlier this week. I started with watercolor paint for subtle all-over color. Then, switched to thinned tempera paint for the bolder magenta hues. During this project, I actually ran out of white acrylic paint – the first time in forever! A good problem to have – it means I am actually creating something. My pile of scraps and old credit card that I use to ensure a smooth adhesion to the canvas. 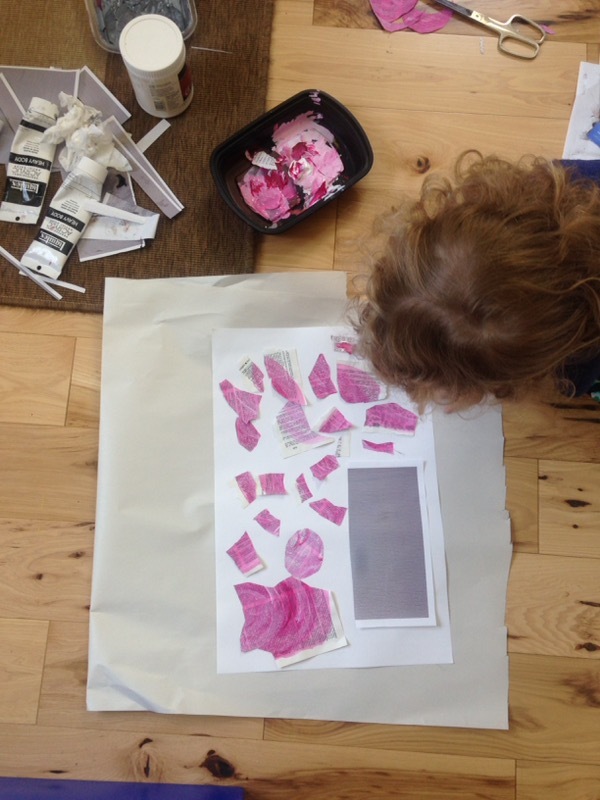 This pile of cut petals and printed scraps was a goldmine for my daughter’s budding creative mind. “Can I make something out of this pile, Mommy?” she squealed with delight. “Of course, you can! What do you want to do with them?” I asked her. “You’ll see,” she replied with a grin. 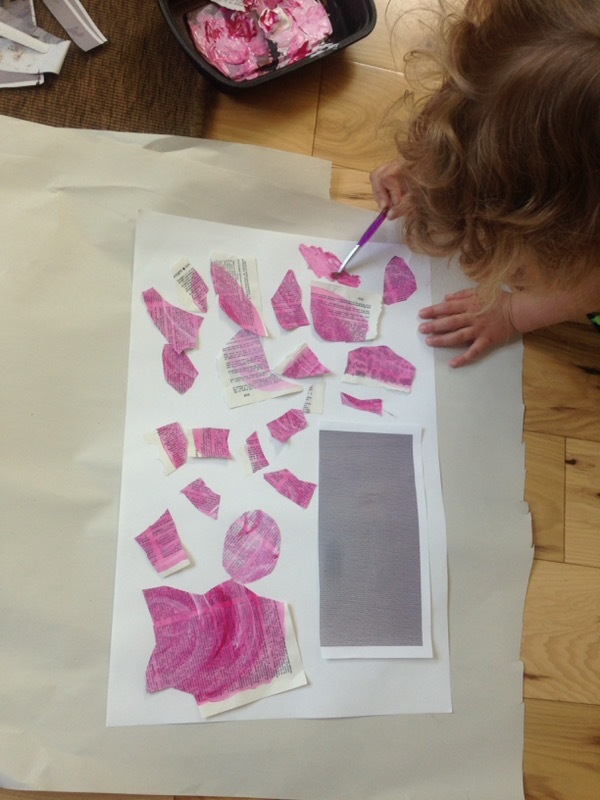 She set to work, glue stick in hand – gluing, tearing, cutting, and arranging. She set up her paint space and requested her paint colors. I was amazed at the care and time she vested in her painting. She was so proud of her careful brushstrokes and the fact that she did not get any paint on anything other than her paper. Her finished masterpiece. We will be doing much more of this kind of collaborative work in the next few weeks, now that school is officially out for me.